It's amazing to see more and more supermarkets widening their range of vegan products, focusing on plant-based ingredients and making plant-based cooking so much more accessible. Recently, Tesco have really upped their game with this and you can see they're really making an effort to cater for people following a vegan or plant-based diet. Not only is there a big selection of vegan friendly products on their shelves but they're sharing delicious meat, dairy and egg free recipes over on their website too! 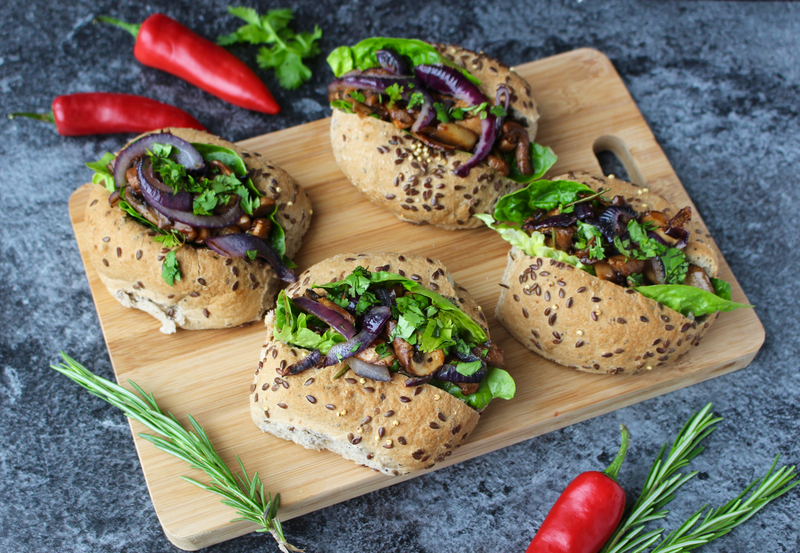 One of their recent vegan recipes is BBQ 'Shroom Buns created by chef Derek Sarno which are a yummy seeded bun filled with BBQ mushrooms, lettuce, herbs, spices and onion. This recipe is great as it gives an almost meaty substance thanks to the mushrooms which is bound to satisfy both the veggies and the meat eaters out there. It also shows just how versatile veggie products can be - mushrooms aren't just for throwing in stews! I recreated Derek's recipe at home (see below) and it really was scrumptious. Tesco sharing recipes that showcase plant-based ingredients is really exciting - they're really proving that vegetarian or vegan meals aren't bland and boring, they're not tasteless and unsatisfying but rather they're full of colour, textures, spice and herbs! They're getting the point across that you don't need meat to make a meal and that putting your focus on lots of veggies can be really beneficial to your health and it tastes incredible too. Hey, it's not all carrot sticks and hummus you know! Tesco's Food Love Stories campaign is all about finding that story behind a meal and proving that special dishes don't need to be laden with sugar and salt to be delicious. Often it's about making simple swaps but will boost the nutritional value of your meal, make you feel incredible and perhaps even make your meals that much tastier. Derek shares his passion for cooking with plants and the inventive recipe in a short video, which you can watch here. You hear why he loves incorporating plants into his dishes, his philosophy that food should be more than just what it tastes like but whether it's good for the environment and whether it's sustainable, which I think is really important too. Tesco stocks a wide variety of fruit and vegetables, as well vegan friendly breads, dips, sauces and even cheese which makes cutting out or cutting down on animal products that much less complicated and not at all boring. They also stock a range of dairy-free milks, dairy-free ice-creams, vegan chocolate, free-from cereal and much much more, all at affordable prices. It's never been easier to follow a plant based diet, and with recipes to try like such as these BBQ 'Shroom Buns I don't know why everyone wouldn't want to be eating more plants!